Net Weight: Packet (260 seeds)1/4oz (10750 seeds)(+$7)1oz (43000 seeds)(+$21)1/4lb (172000 seeds)(+$76) This item is currently out of stock! A colorful and attractive plant bearing tremendous showy flower plumes in varied shades of red and yellow. 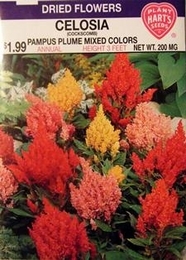 Celosia Pampus Plume Mixed is excellent in beds, as backgrounds for Marigolds, Zinnias, Bachelor Button or Cosmos, or for use as a cut flower. Celosia prefers a sunny location, warm rich soil and plenty of moisture. CelosiaÕs flower heads can be dried by cutting and hanging upside down in cool dry place.